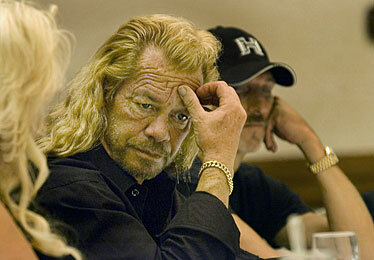 ASSOCIATED PRESS / DOG CORP.
Duane "Dog" Chapman, star of A&E's "The Bounty Hunter," met with lawyers Oct. 26 in Honolulu. His associate Tim Chapman (no relation) is in the background. The fact that Duane "Dog" Chapman used the N-word so emphatically, freely and multiple times reflects his racism is intrinsic, therefore sensitivity training would be futile. People don't change just because they take a training class when the problem is innate, especially at his stage in life. I believe enrollment would be for show and an insincere effort to have his TV program reinstated. Chapman's prayer circle prior to taking violent action on A&E appears to be for show. I view the prayers as absolutely sacrilegious, hypocritical and a tool to impress his audience. Chapman's definition of "ho'oponopono" is incorrect. His violence and chronic, loud, abundant profanity appear to be the rule rather than exception throughout his life and are reflected in his TV show. Chapman and his TV show are not the models I want our children to view or follow. On TV, Chapman cries and apologizes only because his livelihood with A&E is threatened. I believe Chapman's TV show and behavior are an extremely negative representation of the culture and lifestyle of the residents in Hawaii and should be canceled. I'm sick of celebrities getting caught being themselves, then going on a well-publicized "heal my soul" tour. The latest "victim" (they all blame someone else) is "Dog" Chapman, the ex-con who has made a fortune from our islands. We need Chapman like we need a hurricane! He does more harm to tourism in one episode of his TV show than the entire Superferry controversy. This guy is bad news. Did you see him on the talk shows apologizing for using the N-word? He has the nerve to actually shed tears for black slaves! If you missed it, Dog told about visiting a burial ground for slaves. When told by the tour guide that "slaves had no tombstones, but their feet faced the river (Africa)," Dog started crying, then got angry and spoke pidgin. "Hey, bruddah, no talk like dat ..."
Who is this guy kidding? He's from Colorado! Dog has had plenty of second chances. He was a "victim" of 18 armed robberies and a murder. He had his 15 minutes of fame. Dog's time is over. I am so sick and tired of how thin-skinned this world has become! So "Dog" Chapman made those remarks. So what? He was in the privacy of his own home. How is this any different from using slurs for any other ethnic group? It seems that whenever the N-word is spoken, we are suppose to cringe and say, "Shame on you racist," yet it's OK to call everyone else names. No, I don't buy that. Why should Dog apologize? Apologize to whom? He's being treated too harshly. There are far worse things one could do. I have been a member of the Sierra Club for many years. But I have decided that the Sierra Club has become too supportive of halting beneficial public works projects, such as the construction of the Kealakekua Bypass Road and now the Hawaii Superferry, with well-intended but wasteful litigation, costing club members and Hawaii taxpayers thousands and thousands of dollars. Every day in Kona thousands of commuters sit stalled in traffic along the North-South Kona corridor because a lawsuit funded by the Sierra Club has stalled the construction of the bypass road. The amount of gasoline wasted daily is an issue the Sierra Club should be fighting against. Well, I recently got an e-mail from the Sierra Club requesting that I send in my annual dues. I thought, how can I send them money if I must now use it to buy gas to sit in traffic or to pay for higher Superferry fares and state taxes, all thanks to the Sierra Club litigation? I just said no to renewing my membership this year. Perhaps if those who are dissatisfied with the Sierra Club-funded litigation do not renew their memberships, the club officials might come to realize the importance of knowing what the majority of Sierra Club members really want it to support in the future. I just voted by withholding my membership fee. Where do you stand? Having read the Nov. 8 "Gathering Place" column by a University of Hawaii student wanting a "fail safe" warning system for the campus, I was torn by wanting to agree in part and then disagreeing. My disagreement is due to everyone nowadays having unrealistic expectations of 100 percent safety everywhere they go. There are no absolutes in safety and security, and attempting to get close to that 100 percent will come with a price. This is OK if the students want to pay for it as they ultimately will be required to do. However, the more insidious cost is the one that should bother most people: litigation and lawyers. It is a knee-jerk reaction for lawyers to go after anyone or any institution with money on which they can hang the label of incompetence to get someone else to pay rather than the perpetrator of the crime. Be safe out there, but watch out for what you want, you may get it. I am getting tired of hearing politicians talk like they represent either Republicans or Democrats. I thought that once elected, a politician represents all his constituents regardless of their party affiliation. These fellows seem to worry more about what their party will think than about our young men being killed by the hundreds. I don't know how it can be so hard to figure out how to end this war. It's easy: bring our troops home! Bingo, no more war, and no more soldiers getting killed for people who say they don't want them there in the first place. As a Vietnam vet I remember that the war there only ended when it was political suicide to not pull out. Politicians, do your job. Listen to the American people. Get us out of Iraq. If you can't do that, then grab a flak vest and a weapon and join the fight. You don't just represent Democrats or Republicans, you represent all the people of America, and we are sick and tired of you voting yourself raises to sit on your collective butts and do nothing. I support our fighting men and women as much as anybody, but I am tired of them dying in a war that nobody wanted and that politicians lied to us to get into. To keep this war going is morally wrong. So do the right thing, end it now. I hate to say it because it's been said a millions times before, but George Orwell was right. Our language has nearly been emptied of any truth, honesty or relation to reality. It's almost like the very words that inform and evoke our lives are playthings now. For instance, the story "Majority of Kapolei Commons' space filled," (Star-Bulletin, Nov. 9). For goodness' sake. I don't know who thought up that doublespeak nonsense, but to name any capitalistic venture "commons" is repugnant to anyone with a shred of historical understanding. The commons -- in Hawaii, in England and in many other localities -- were open lands, set aside for anyone to use and enjoy. The commons were free, largely unrestricted, and using them didn't require a lease or a deed. Kapolei Commons is hardly that. A big fat boo to the marketers who thought up this one. Recently, there's been talk about a rift between neighbor islands and Oahu. Once again the noisy minority is getting all the attention. I speak now for many more than the xenophobic protesters enveloped in nostalgia and hysteria. I am ready to welcome any and all from Oahu. My attitude has made a major sea change because during this controversy, I turned to Oahu for my political representation. Here on Kauai, myself and those I speak for now were misrepresented by three politicians in particular and others. God bless those Oahu legislators. According to SMS research polls (not Superferry's QMark Research pollsters), Superferry sailing while the EIS is being done was supported by 64 percent statewide (7 percent said "maybe") and 53 percent on Kauai (3 percent "maybe"). We knew this all along because the majority in any society does not commit or applaud the abhorrent behaviors we witnessed on Kauai. If it did, we wouldn't have a society. Our self-righteous political triumvirate on Kauai not only ignored the majority, they ignited the xenophobes with dishonest statements about illegalities. Please now support Senate Bill 184, which allows us all to recall chuckleheads like these. I am not all that enthused with the ferry since it won't be going to the island of Hawaii for a few more years, but I am of the opinion that Hawaii needs it. Those who vehemently oppose the ferry seem to be newcomers, Hawaiian sovereignty advocates and surfers. Those who mention whales are just digging for more reasons to touch certain people. If they are so concerned about whales, then stop the sighting tour operations. The sovereigntists oppose everything, but when Alaska Airlines was written up as making direct flights to Kauai, there was not one peep against it. Why? Aren't passengers possibly transporting invasive species and other non-native items? I say stop the shibai against the ferry and get on with it. Much of the cost being cited to upgrade Honouliuli's waste-water treatment plant is related to plant expansion rather than the cost difference between secondary and primary treatment. Also, the city is already mandated to provide secondary treatment for all new expansion and treats a significant portion of the existing flows at an even higher level now for water recycling. The city charges developers fees to cover new expansion and should increase these fees if required so as to not pass these costs on to all ratepayers. It should also be noted that water recycling allows for cost recovery. Dumping in the ocean does not. Water recycling helps protect our island's precious water supplies. Why irrigate golf courses or highways with potable water? Also, higher levels of treatment should be combined with methane recovery and power generation. About a third of the operational cost is for energy. The latest expansion at Honouliuli was supposed to include methane power generation. With energy costs rising, our treatment plants need to be models of sustainability or taxpayers keep paying these costs through higher fees. Finally, the city has tested a new membrane treatment system that would significantly reduce costs and has been used with success elsewhere. It is unfair to taxpayers to use boogeyman numbers in this debate for clean water when cost-effective technologies and solutions are available. As always, it takes leadership and innovation rather than foot-dragging and PR campaigns. During a ceremony for National Caregiver Month, Gov. Linda Lingle said she would push for expanded tax deductions for family caregivers during the next legislative session. I hope legislators listen. When people decide to care for a family member at home instead of putting him or her in a long-term care facility, they are taking on heavy obligations that may require them to leave the work force. As it turns out, they are also saving taxpayers money. Therefore, I believe providing caregivers with more tax relief isn't just the right thing to do. It's the common sense thing to do. Thanks, Governor!